Many midrange and high end telescopes come on equatorial mounts. These mounts are fantastic for tracking celestial objects. Someone who wanted to take pictures of objects in the night sky might even say they are required for all but the most basic astrophotography. The problem is that they can also be unintuitive and require some knowledge to use. Until now, in order to obtain all the knowledge needed to leverage an equatorial mount to its full potential you would have had to compile information from a variety of sources and attempt to mesh them together. The frustration this could instill might, and indeed has, caused some potential amateur astronomers to give up and pursue other hobbies. Using an equatorial mount does not have to be this difficult! Whether you have a goto equatorial mount, or a fully manual one, with this book you can now assemble, set up, adjust and use your equatorial mount with confidence. All equatorial mounts for telescopes share common ground so regardless of the mount’s age or manufacturer you can be sure you will not only know how to use it, but also understand why it is the way it is. If you have ever struggled to figure out how to use an equatorial telescope mount, this is the book you always wished you had. 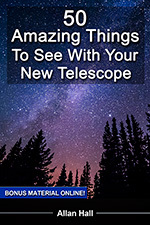 When it comes to tracking celestial objects, more advanced telescopes will probably have an equatorial mount. Many midrange and high end telescopes are set on these mounts – and with good reason. For visual astronomers, the equatorial mount allows the greatest accuracy and tracking ability. An equatorial mount is also a prerequisite for anyone with ambition to seriously capture astronomical events and bodies via photography. They allow an astrophotographer to pass the most basic, primitive shots and begin to advance the pursuit into long exposure astrophotography. It’s also wildly frustrating at times. Call it an occupational hazard, but many would-be astronomers and astrophotographers have discovered what Allan Hall learned over decades of hands-on research and self-motivated study: equatorial mounts – in terms of assembly and use – are counter-intuitive, often without instruction, and complicated. Considering that the mount needs to be viable, presentable, and functioning with precision in order to begin observing and photographing the night sky; this represents a real road block for many people. In “Getting Started: Using an Equatorial Telescope Mount”, Allan Hall sheds light on the best strategies for crossing this initial bridge that holds so many people back from pursuing these rewarding disciplines. Hall delineates, clearly and plainly – with a love for all things astronomy related – the ABC’s of your equatorial mount experience. Beginning with why an equatorial mount will lead you to the most rewarding craft, Hall writes with the engaging, patient tone of a man who knows his field and knows what awaits those who master this early aspect of using the equatorial mount. Terminology, strategy, and setup can be stress-free, even when facing down problems that halt advanced users, such as cone error and the various elements of alignment that can be stumbling blocks. The author of a series of books on astrophotography, celestial bodies, advanced telescope use, and more; Allan Hall’s books are a treasured resource for those ready to begin their journey at home. 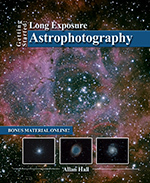 Today: for the first time, amateur astronomers and astrphotographers can develop their skill set in a fully-informed way using the tremendous wealth of information and experience available, as well as equipment that is precise, professional, and affordable. 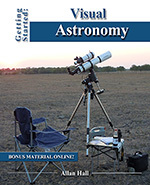 With levity, concise instruction, valuable practical advice, and warmth, Allan Hall’s “Getting Started: Using an Equatorial Telescope Mount” is your starting point for the most accurate tracking of celestial bodies. Remove the frustration and wasted time that come with trying to assemble an equatorial mount yourself. Learn from the broad experience found in “Getting Started’, and begin your understanding of the night sky and the measurements, balances, and alignments that you need to observe and potentially capture it in images. 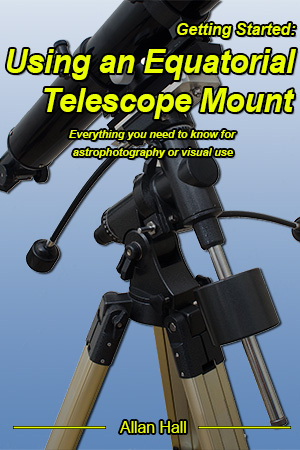 Begin today with “Getting Started: Using an Equatorial Telescope Mount”, Allan Hall’s comprehensive guide to a stress-free start in your observance of the celestial skies. I hope this book helps you better understand and use an equatorial mount.